It’s like how smart the feature is. It can correctly handle hard cases like “she said” or “he said” quite well. Note that the mention of “True Lies” in the first quote didn’t throw it off, even though it was in quotes too. Once you’re looking at the news quotes of a person, you can also search within their quotes. 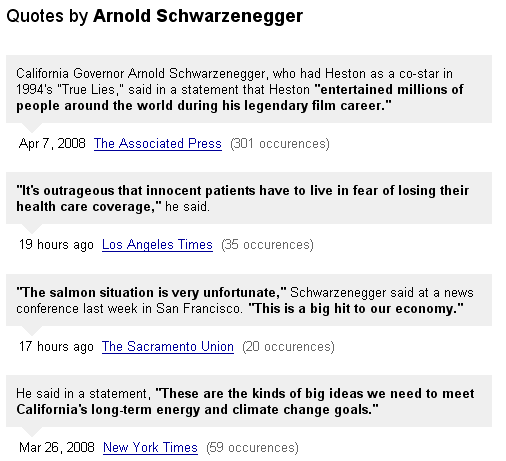 So you could see what Arnold had to say about California’s hands-free cellphone law by searching his quotes for [cellphone]. I like that Google is doing this for a couple reasons. First, it’s an additional way to slice and dice news information that wasn’t really available before. In that sense, it reminds me of taking geographic mentions in books and plotting that data on a map of the world or over time. There’s no way to do that scale of research or analysis by hand. The other reason that I like this feature is that it fits in with a basic Google philosophy, which is “you enter whatever interests you in the search box, and we’ll try to do something smart to help.” I really like that we have features like a smart calculator. Or that you can type in [whois example.com] and we’ll give you some information about the domain. Or that you can type in an airline flight like [aa 125] and get up-to-the-minute flight status. Users don’t have to do anything special, but we work hard to show something helpful for each search. It is definitely cool that Google is in the position to polish its systems and offer cool new search result options. I think that is what I like the most about it… intuitive. Now that said, I know that many of my less geeky friends and clients have no clue that these exist… perhaps Google should focus on an educational angle. I bet that would increase the loyalty of it’s users even more! An advertising campaign on TV would be a great way to do this… I can’t recall if I have EVER seen a Google commercial come to think of it. So far it is only for very high profile people. It seems it is functioning only for English language sites. I searched Google News for the prime minister of Denmark Anders Fogh Rasmussen and got only English language sites, not Danish ones. Hey, when did they bring back the WHOIS OneBox? And why doesn’t it say to whom the domain is registered? I agree with Ross. Google continues to pump out all of these cool little features and products, but it seems to me that the only people that use or talk about them are SEMs. I follow search engine stuff relatively closely (but not super closely) and don’t even think to use most of these features… Google should look at ways to better inform and equip the ordinary person with these tools. I must be doing something wrong because I keep getting errors when performing these searches. I’ll research it later but wondering if quotes are searched only for political figures. Current state of NLP systems achieve relatively good performance in both of above tasks. News corpus (like Reuteurs) have been beaten to death by the NLP community. Its the first time someone came out with a service. Its pretty neat IMHO. Harith, I wouldn’t be surprised if the “news quote” feature was only for English, for now. Tony Ruscoe, the whois onebox is pretty recent. I like the idea of showing the registrant name; I’ll pass on that feedback as a future feature request. Another cool feature, cool 🙂 Now we just have to rely on the reporter quoting the person correctly and in context. Unlikely. Nice touch, Matt, it will be very useful to me in my work. As with many other features Gogle often keeps it’s light under a bushel. If the company has one weakness it is in the PR area. Google do so, so much more than most users ever know about. Now, as has been heard before. Make queries respct case and you’ll have a search company going. “GPS” is not at all the same as “GPs” and when a user takes the time to enclose a string in quoyes it would be good business, as wellas proper programming to respect the quesry and return results that actually _matched_. We are discussing with Googlers in Dublin another project related to search and our web developers looking at that matter at the moment. We might test it very soon. well the one box for travel (“city1 to city2”) is another of google’s cool features. and if we look at the google guide, there are many many such usability options normal users are not aware of. awareness is really necessary to make users well equipped with the options they can have. however, the news today are the release of qrtr results that took comscore by surpirse..
wts ur take matt on this? Google these days is concern over its blog search and news readers. Thats a good step to make these services more usefull. You can try ajaxwhois.com for that purpose. How do they decide who are the influent people that “deserve” having the quotes stored for? Does google have some sort of people rank? I see that you’re not (yet?) included in the quotes search http://news.google.com/news?hl=en&ned=us&q=matt+cutts though there are mentions of you in the news. Also, is there a planned feature to search for a company name (say microsoft) and get quotes for people that are important within that company (that Bill guy)? Harith, I’ll pass that feedback on. I think a non-English version of newsquotes in several languages would be very cool. Claudiu, I think it’s mostly just people that show up in Google News. I’ve had a few mentions in Google News sources in the last month or so, but I don’t think any of them had a direct quote from me. I agree that the ability to search for a company and get quotes by people in that company would be very neat. As a small-time webmaster, I was shocked to see some results for my own name (thanks to a few press releases I’ve submitted over the past few years). This kind of thing is incredibly helpful, kudos to Google. And I HATE the new whois feature. Apart from making spammers’ lives much easier (to harvest email addresses), there seems to be only one provider of whois data at the moment, and if you go to that provider’s whois page (e.g. http://whois.domaintools.com/google.com) you can see an EXACT copy of all your HTML in the source code of that page, probably due to their use of the SEO Text Browser tool. Isn’t that flouting the copyright laws? 2) Hasta la vista baby. 3) If it bleeds, we can kill it. Unless he ever said something else that has valid meaning ? I’m sort of with Dave on this one, but from a different angle. This would be a cool feature IF print news sources (and let’s face it, Internet news in text format is a print extension) could be trusted to report stories accurately and in context. Neither has been the case for quite some time, and there is nothing to suggest it will be. Not only that, what happens when a bunch of spammers get a hold of this feature and start “quoting” you? This is an okay idea in principle, but at least two groups of people will ruin it in practice. I agree with you 100% as far as Google “Serving up something intelligent.” I remember the old days of hot bot, and lycos. The queries you would have to enter to get even the smallest piece of relevant info was ludicrous. Also, please thank whoever is responsible for Google Suggest Australia. Invaluable Tool. I think that it’s innovation like this that has kept Google on top, yet another feature for me to add to my ‘just-cant-spend-a-day-without’ list! Thanks for highlighting it Matt. I’ve used the flight status search feature before but I didn’t know about the whois. That’s convenient. I tried, Matt Cutts, Danny Sullivan, John Battelle, Sergey Brin and Larry Page – nada. However, I did get quotes for Steve Ballmer (but not Bill Gates) and Barack Obama. Very interesting – would love to see it grow.